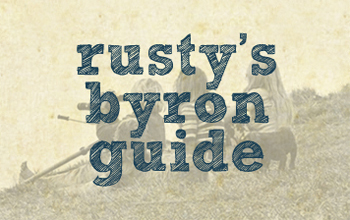 Rusty, and his daughter Taylor, also a well-known and respected local surfer, offer personalised / individual teaching that is specifically tailored to meet the needs of the person. The first session is not just standing up and riding the board, it is an assessment and a lesson about surfing in all its ways. Besides catching and standing upon waves, Rusty Miller Surf teaches procedures of safety and relates knowledge, attitude and philosophy of the world of surfing. At Rusty Miller Surf, you learn about surf culture and the magic of connecting with nature through surfing. Rusty Miller Surf holds an exclusive license for teaching ‘one-on-one’ at Watego’s Beach, at the tip of Cape Byron Headland, Australia’s most easterly point and also at the iconic surfing beach The Pass. Rusty Miller Surf has inspired and assisted many to ride waves safely and to harmonize with the energy of the ocean. Rusty’s daughter Taylor, who has been passed on the Aloha surfing tradition, is available to teach with Rusty for families and/or private lessons. 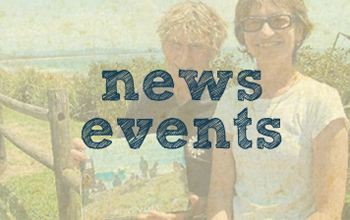 Taylor is a born and bred Byron Bay surfer and a fully qualified Surfing Australia coach. You can read more about Taylor HERE. Rusty has taught hundreds of students over the years not only about the act of surfing but also its culture, history and Aloha Spirit. Together with his well surf travelled daughter Taylor they have developed their own method of personalized instruction, which will advance and enhance your surf skill and appreciation levels. 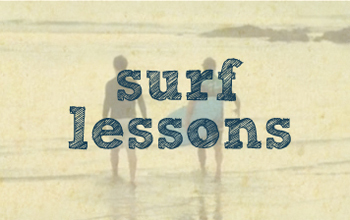 For the beginner surfer the sessions show one how to learn basic principles of posture, water knowledge and personal safety. For those with some experience there is always room for improvement through good reflection while being accompanied and studied in the surf. 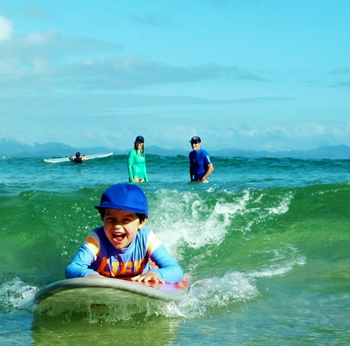 There is so much more happening in these surf sessions than just sliding on to the waves off Cape Byron. 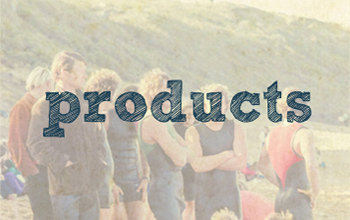 Come and join them to enhance your surf through life. Rusty & Taylor teaching little Henry at the Pass Beach.